Read Sahih al-Bukhari And Sahih Muslim Hadith books in English Language on your iPhone. With built in text customization features. 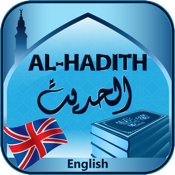 User can send or share any Hadith or part of any Hadith in English to his / her friends through many social sites like Facebook and twitter. Full Featured Version. > World's favorite English Font is used to read for long. 1. Run "English Hadith" App from the iPhone. 2. Select any Hadith book by flipping on the book icon in the main window. 3. Select any chapter to open. 4. Can turn the pages by flipping on the screen left/right. 5. Pinch/Finger Gesture on the screen to zoom in/out the text. 6. Press social site icons to send/share the text with friends. 7. Tap on bookmark icon to add the opened page in the favorite list. 8. In Settings, you can change the text color and size. 9. Tap on "Clear All Bookmarks" to delete all the saved bookmarks.